Paco Rabanne Lady Million EDT is a lighter, fresher and more relaxed version. 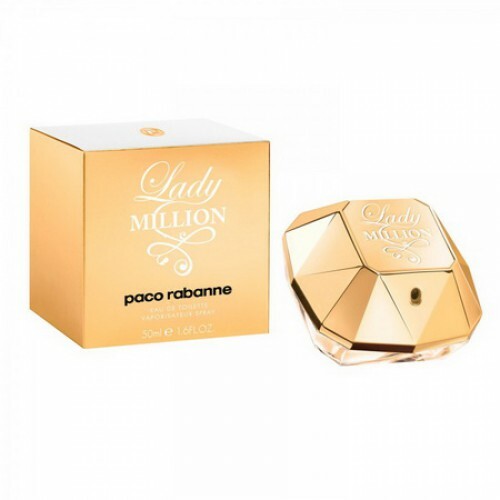 Paco Rabanne Lady Million EDT 80ml. - Gorgeous fragrance in perfume is a very interesting combination of flavors : spicy and intriguing . Lady Million Eau de Toilette by Paco Rabanne - a fragrance for women, belongs to a group of flavors floral woody musk . Smell disclose lilies and gardenia with honey. Neroli and lily of the valley echoed spotlessly flavor Lady Million Eau de Toilette. But the main , the most seductive chord disclosed in combination with sweet honey notes of sensual patchouli. Bright amber notes swirl and change with every movement of the air , revealing various aspects of fragrance Lady Million Eau de Toilette ( Lady Million ) , like playing a beam of light on a diamond. Top notes of neroli and lily of the valley ; middle notes of gardenia and hyacinth ; base notes are patchouli and honey. Perfumer, who created both the original version and the modern novelty is Anne Flipo . Lady Million EDT - easy and carefree, bright and colorful, seductive and sensual fragrance - belongs to the family of trees and flower. Compared with the previous new fragrance composition contains less honey sounds and has a fresh character. Top notes of lily of the valley, neroli Heart: gardenia, hyacinth Base: patchouli, honey. Face advertising campaigns Lady Million EDT stopped actress and model Dree Hemingway.